I had a very specific theoretical agenda for each week of the class and assigned a couple keywords to each week, both to help students focus their reading and to serve as a mnemonic device in subsequent conversations. For example, in week two, I paired the keywords “digital utopianism” and “computational metaphor” with readings from Fred Turner’s From Counterculture to Cyberculture. As they read, students could jot down ideas for a definition for these terms in our class Google doc, and at the end of the week, we wrote out fuller definitions together. (I typed, they dictated.) As I explained to them, these are not dictionary definitions of the terms, but elucidations of the terms as we used them in the context of the class. I then used the terms as the basis of our final exam. A pre-exam study session, in which we went over the list of words, was also my sneaky way of trying to tie up loose ends and bring some coherence to the list. I found this to be a very useful tool, and the students said they did, too. It was a great way to check to ensure we had covered what I’d intended to cover before the class moved on, as well as a way to gauge whether students understood the big concepts. And we could easily check to see how and whether students had made connections among the various weeks: How might the “computational metaphor” relate to “modularity,” for example? If I were to do this again, I might assign one particular student responsibility for each term, and ask him or her to oversee the definition. One of my favorite exam questions was about which key term students would add to the list. I loved these answers. I particularly remember a student’s suggestion of “implicit knowledge” — a kind of meta-suggestion, which she used to describe how she seemed to know about some of the concepts we discussed in class, like Arlie Hochschild’s “emotional labor,” but hadn’t had a word for them before. Isn’t that a great description of coming to theory, only to find that it seems to know you already? I’ve used blogs in quite a few classes before, but I wanted to try something different this time. I was thinking about how when you’re taking a class on a particular subject, everything in the world reminds you of that subject. I wanted students to be able to write about that experience, so I asked them each week to post a primary source that reminded them of their reading, and to explain why. For example, during the week we discussed infrastructure, one student wrote about the spray-painted utilities markings that you see on the sidewalk. I then asked each of them to comment on two of their classmates’ posts. I made sure that I commented on each post, too (do-able in a class under 20). Field trips and a guest speaker! 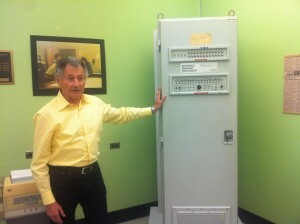 Leonard Kleinrock with UCLA’s Interface Message Processor. 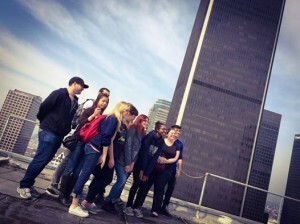 Thanks to funding from the Urban Humanities Initiative at UCLA, I was able to do some special things with this class. We brought Andrew Blum, author of Tubes: A Journey to the Center of the Internet, to give a lecture. The students loved the book, and were so excited to meet Andrew, who gave a wonderful talk. At Andrew’s suggestion, we followed up his lecture with a trip to UCLA’s Kleinrock Center for Internet Studies — arguably the birthplace of the Internet — where Len Kleinrock himself drew a diagram of the original ARPANET. I was touched to see how excited the students were to meet him and hear this origin story. It was a goosebumps moment, if you’ll forgive my enthusiasm. 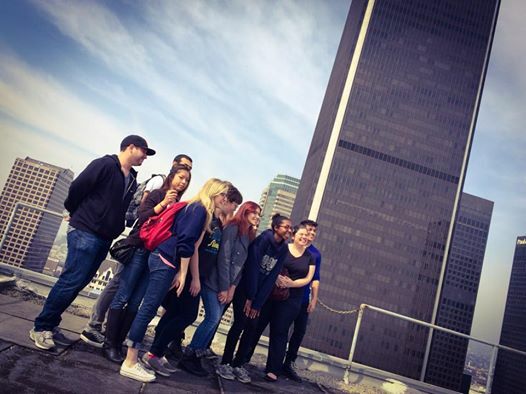 We also took a field trip to One Wilshire, home of the West Coast’s largest Internet exchange. (Atlas Obscura helped to facilitate the tour.) There, we got to see in person where … well, where the wires connect. I loved hearing about the center’s peanut problem: Tenants unpack so many routers to accommodate the ever-expanding Internet that the custodial staff struggles to keep styrofoam packing peanuts out of the ventilation ducts. We also learned that high-frequency traders are willing to pay a premium to move their servers a few feet closer to stock exchanges’ matching engines; that the ads on Facebook really are served up faster than the rest of the content; and that the Internet really does live (at least partly) in downtown L.A. I dithered a lot on what to assign for the quarter’s final project. This was a digital humanities class, so I wanted the students to engage with technology, but students (as they always do) came with a real range of technical knowledge. Plus, since there was so much to convey in a quarter, and since we had no separate lab section, I hesitated to devote too many classes to technical workshops. I considered a lot of different things: digital storytelling, mapping, a text-adventure game, an Omeka site. In the end, I settled on Scroll Kit, a relatively new platform for building multimedia long-form narratives. Students didn’t need to know how to code to use it, but students who did have some technical knowledge could enrich their groups’ projects. I liked the way Scroll Kit requires students to pay attention to visually punctuating stories, to think about the rhythm of a narrative, and to thoughtfully incorporate multimedia elements. I assigned groups, asking students to fill out technology self-evaluations so that I could distribute skills fairly equally. Their assignment was to write narratives, modeled on The Atlantic‘s “object lessons,” about digital devices. 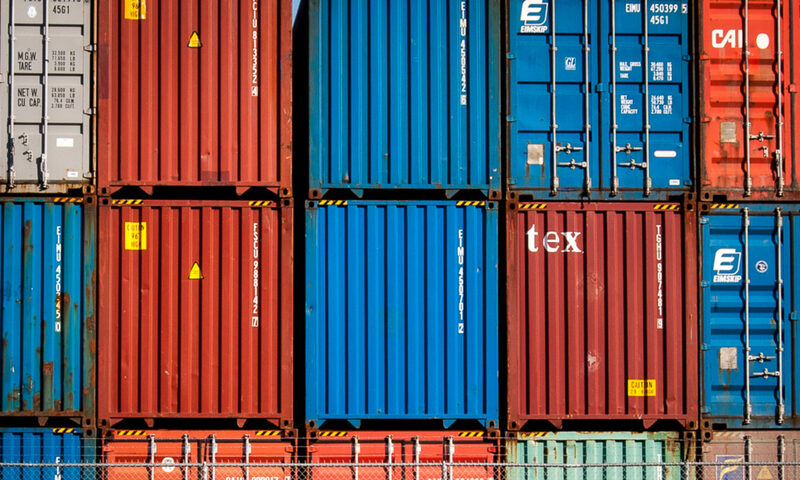 They had to prepare bibliographies on each device’s supply chain, cultural significance, prefigurations, and corporate ownership. I had a lot of milestones and due dates along the way, which I think helped students to feel less freaked out about the assignment. To grade the essays, I adapted a rubric devised by Ghanashyam Sharma and described in an essay for College Composition Online. I was pleased with the rubric and felt that it reflected what I was trying to accomplish with the assignment. The students liked Scroll Kit a lot, and produced amazing pieces. There were a few hitches, however. Scroll Kit has a few bugs, and students found that if they didn’t save often, they were likely to lose their work. There’s also no real simultaneous-editing capability, an issue I hadn’t really thought about — so they overwrote each others’ changes from time to time. More significantly, I think I’d have a better prompt next time. I often think (erroneously) that giving students a very open-ended essay prompt will help them to feel free with their work, but of course, the result is that they’re confused about what I want. I had to keep steering students away from writing Wikipedia-style encyclopedia entries on their devices when what I’d wanted was a more critical take. And of course, if that’s what I wanted, I should have asked for it! Also, we should have talked more about how to read an object, in the way that material culture scholars know how to do. I suppose I thought that if I pointed them to some exemplary essays, they’d figure it out, but we really should have devoted more classtime to this. I’d also build in more time to talk substantively about other multimedia narratives on the web. I’d meant to — we just kept running out of time! This ten-week quarter is rough. So some things I’d definitely change up, but also a really special teaching experience for me. I emerged with a ton of ideas, and endless respect and admiration for my students, who always surprise and delight me. Wow, Miriam! You are a total inspiration. And thanks for the introduction to Scroll Kit – I’ve recently been thinking about different digital platforms for student work, so will mess around with it soon. And have you read Michael Lewis’s latest book on high-frequency trading? Thanks so much, Mark! If you do decide to use Scroll Kit, I made some tutorials and handouts for my class (basics and the parallax effect). I’m just finishing up Flash Boys now! I have many different thoughts about it, but I was thinking that the first chapter in particular, where they’re laying cable, would have been fantastic to include in this class. Next PostNext How Did They Make That? The Video!